Stockport ‹ Series 4 ‹ Flog It! Paul Martin and experts Nigel Smith and Thomas Plant visit Stockport to find antique and collectibles worth selling at auction. Paul visits an independent family brewery. Browse content similar to Stockport. Check below for episodes and series from the same categories and more! This magnificent staircase earned its designer a knighthood for excellence in architecture. 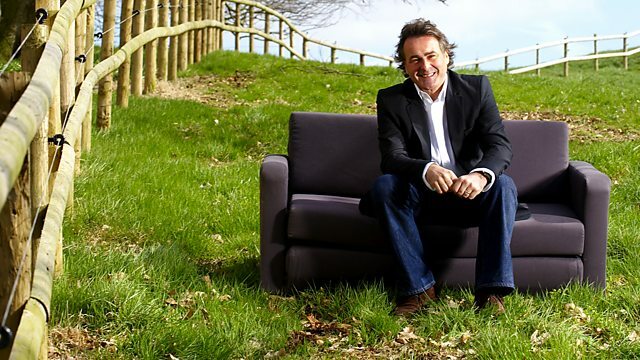 We won't get a knighthood, but we are looking for excellence in antiques in Flog It! Our venue today is Stockport Town Hall, which was designed by Alfred Brumwell Thomas in the early 1900s. Yes, the columns are made from magnificent Italian marble. It's an entrance that bristles with opulence and civic pride. weddings and other special occasions, such as Flog It! Nigel Smith and Thomas Plant. They'll be picking out items that need to win the bidders' favour at auction. I would NEVER have thought that! -She didn't think it would sell. It's time to let the queue in and see who's first at the table. Thank you for bringing along this charming bear. -Have you come a long way? What can you tell me about the bear? I was given it when I was about six. and they had a large one in the hall which frightened me. -And this was the... And I liked that. And when I was leaving, they gave it to me. A fantastic thing. The larger ones are very, very expensive things. Neil, how do you feel about your mother selling this heirloom? Well, I've never been attached to it and I didn't think it was that old. I always thought it was picked up from a holiday in Austria or Germany. Well, it might well have been, but 100 or so years ago. They tend to be called Black Forest ware. I think it's carved out of limewood. He's got nice little inset bead eyes and some sort of varnish over him. He's not in too bad condition. These things are very collectable. That big bear you remember in the hallway could be worth several thousand pounds now. -A little piece like this is still of interest to collectors. Why do you want to sell him now? so I'm frightened of him getting broken. I think a collector would pay a reasonable amount for this. worth around the £100 mark. -Would you be happy to sell it for that sort of money? -He's lovely, though. He's nice. -Do you want to put a reserve on him? -Do you think I should do? I would think a reserve of £80. -Then if it makes 150, we're all happy. Stuart, tell me about your Merit steam engine. It's been in the dark, in a cupboard for many years and it's much better going to someone that can enjoy it. I can't say one way or the other. I suspect it was bought for me, but it might be from my late father. -Did you get it going? -It has been going, many years ago. What I like about it is it's a steam engine in its original box. This is in lovely condition. We've got the instruction manual here and helpful hints, etc. we've got what else they did. "If you want the very best ask for Merit precision quality products. "induction coils, Morse keys, buzzers..."
which produced the steam to power the piston. You could put a belt round this and attach it to another object. I notice that, on the back here, "Our range includes..."
using his miniature steam engine. There will be collectors for this item. The valuation's not earth shattering. -We'll probably get between £50-80 at auction. -Better than a poke in the eye, isn't it? -Better than what I had in mind..
-Well, we can always talk it down! Whilst Thomas works up a head of steam, it's Brenda's painting that's got ME all fired up. Well, tell me all about Byron. How did you come by him? Byron was hung on me mum's wall for a long, long time. She always used to point to it and say, "That's very valuable." We didn't take much notice. and just move some of these panel pins and take this out. Personally, I feel the modern frame lets this oil down. I don't think there's much value in this frame, possibly £20 or £30 at the very, very most. Let's take a closer look at Lord Byron. Poet, dandy and flirt! He died so young, didn't he? I think he was 36 when he died. Born in 1788, died 1824. There's no damage to the canvas at all and it's not been relined. -That's a very good sign. Collectors and dealers love that. And it hasn't been cut down. For a moment, I thought it had been cut down from a larger portrait. You can see where the canvas ends, you can see where the paint ends. Lovely muted hues. I love the waistcoat, the shirt. Especially the way the linen in the necktie, those folds. But look at the skin pigments. but it's got that shabby-chic, faded-elegant look. That is worthy of the Royal Academy. That's that good. and why I got it out of that horrible frame. You really don't like that frame! -Do you know what I'd do with that frame? -and use that as a mirror. -In the hall or in the loo. And put this into auction like this. Value? -£200-300. I'm pretty sure we'll get the top end. -I want to stick it in auction, if you don't mind. Tell me about this little plate of yours. It was left to me by my grandmother. Passed it on to my parents. Well, I was surprised to hear that it was of value because, clearly, it's only a cheaply pressed thing. Not hand painted or anything. You're right. What you do see with Victorian Royal commemorative china is a lot of her diamond jubilee. Loads of plates, "the sun never sets on the Empire", all that stuff. you don't see much of it. It's much earlier. There's the pretty Victoria there, nice-looking image. The proportions are good with the plate. We don't really know who it's made by. It's very thin pottery. -if we put it in at £100-200, I think it could do quite well. What's the reason behind selling it, after your grandma having it, your mum and dad having it? It is of more value than I would have expected. my lads play guitar, it might give them some studio time. Quite a good way to give him some cash really. Otherwise they might just drop it on the floor. In the antiques world, we're always keeping a keen eye out for pairs. It puts the value up and they always look so good together. Just ask these two, they're twins. Nigel's heard about pairs too and has made Kath fetch her mum for doubles all round. Doreen and Kath, thanks for coming along. Did your daughter go and fetch you? This is your object, really. Just the history I know. It belonged to my father-in-law. and some big hotel was bombed and he found it in the debris. Your daughter told me something about your current use for this. I put all me bills that I've paid behind it. When I've paid them, I put them behind Romul and Remus in the dining room. It's quite worn on the top. He gets fingered quite a lot. Not by me. He hasn't been fingered much since I've had him. you would have bought in the late 19th century. It's what we tend to call a Grand Tour item. You can bet this was bought in Rome when somebody went to Italy. It's been bought as a keepsake. and then eventually discovered by a shepherd who took them in. -They went on to overthrow their uncle and found modern Rome. -Oh, right, I never knew. This image is used as the official badge of Rome. It's on a rouge marble base, or porphyry it's sometimes called. -It's very unusual. Any idea what it might be worth? -I don't think me Grandad Blogg knew it was worth anything. -His first name wasn't Joe, was it? She grabbed it off your mantelpiece? She rung me up and said to bring Romul and Remus down. So I drove down and passed it in to her. -I think we'll get between £100-150 for it. I would suggest putting a reserve of 80. Are you happy with that? -Happy to see it go? Not gonna miss it? -What are you gonna put your bills behind? -I'll have to find something else! Never thought of that! Our experts have selected their first batch of antiques to send off to the auction room. so she's decided it's time to sell. was Stuart's toy worth between £50-80. but his sons want some costly studio time, so Granny's plate has to go. We were honoured today to have a visit from Rome's founders Romulus and Remus. whilst Doreen's after a new billholder. of Lord Byron, famous for being mad, bad and dangerous to know. It's well worth £200 of anybody's money. a listed building and formerly a mail coaching inn. back in Victorian England delivering the mail and newspapers. a heck of a lot of money for a newspaper. It's time to find out if our owners' lots are expensive at today's rates. What does auctioneer Patrick Cheyne think? fell in love with it. It's the sort of thing I would love to have. It belongs to Brenda. Sort of around 1815, believed to Lord Byron. It's been in the family a long time. Brenda's agreed to part with it and I'm hoping £200-300, and a bit more. I think you're absolutely right. It's a very charming picture. so I put, "believed to be Lord Byron". I've got some interest in it from a curator of a museum. So we'll keep our fingers crossed that it will do very well. -This could be the big one. I can't wait, but which lot is first today? It's time to say goodbye to that little Black Forest bear at £80-120. It belongs to Joyce here. You're here with your son Neil. -Are you sad to see this little bear go? I have a table he used to sit on and, er...it looks a little bit bare without my bear. -Do you want to take him home? -You do? It's a bit late. You can't do that unless you buy it back! -I think he's going to do well. -I should have held out for the daddy bear, shouldn't I? -He's the baby bear, isn't he? -Hopefully, baby bear is going to get top money. -Yes. If it was mine, I couldn't bear to part with him! Lot number 90, the carved wood Black Forest bear. Rather nice this one. Say £50 to start me on this one. £50 is bid. 55, anyone? I've just realised he looks quite cute. 70. 75. 80. 85. 90. At 130. Right in the corner. At £130. Anybody missed at 130? At 130 it's going. All done at 130. -Thank you very much, Nigel. Thank you, Paul. This next deserves a little bit of merit. It's the steam engine at £60-80. It belongs to Stuart. You've had this since you were a nipper. Are you feeling a bit guilty about flogging it today? Come on! -It's a lovely little thing, Thomas. -I always wanted one as a kid. I saw friends with these and I was slightly jealous. It's definitely a lot for the boys, so I'm sure this one is gonna go. Let's watch it steam away. and original box complete with instructions. £20 to start me on this one? £20 is bid. At 22 now. 30. 32. 34. 36. 38. At £38... 40 in a new place. At £40. 42 against you. 44. 46. 48. 50. £50. At £50, right in the corner. All done at 50. Going at £50. -You're gonna take the money. This is the moment I've been waiting for. It's the oil on canvas of Lord Byron. £200-300. And it belongs to Brenda who is grandmother of the year, I reckon! How many grandkids have you got? -Ten? How many sons and daughters have you got? -Three sons and a daughter. So you've got lots of people to treat if you flog this! -I said to you at the valuation day that I love it. The auctioneer loved it. We had a chat with him. -He said there's been some interest from museums. I think if two people push each other, we could be looking at 400. That's what I secretly want. OK? -I hope I won't let you down. half-length portrait of a gentleman believed to be Lord Byron. I'm bid £50 on this. May I say 55? 55. 60. 80. 85. 90. 95. 100. -Come on. They started so low. At 195. Is there 200 anywhere? All done at 195. Anybody want to bid 200? -It didn't reach the fixed reserve. I'm so sorry. I built this up. I can see it's worth £200-300. It's worth the top end of 300. -I don't want to take less than 200. There's another auction room and there's another day. I insist that sells for nothing less than £200. -It was the wrong day here. -There's nothing wrong with the picture, or the valuation. the commemorative plate. Value £100-200. We're hoping it's gonna be a big hit cos the money is going towards, hopefully, making a big hit. -Your sons want some studio time. -They're both good players of guitar and they've got stuff to record. -Oh, yes. I've emptied plenty of pubs and clubs in my time. -Are you gonna be playing on this big hit? -If I'm invited, but I suspect not. I wish them well! I really do. I love it when kids get involved in music. -Thomas, there's a good cause here. -Let's hope they do well. Lot 131 is a rare, small, commemorative child's plate. May I say £50 for it? £50 is bid. 55. 95 in the room now. 100. 110. 120. At 120. All done at 120? At £120. He's put the hammer down. £120. -That's not bad. Hopefully get a few hours in the studio. -Knock out a demo and hopefully it'll be a smash hit. We've got a lovely bronze of a she-wolf now, belonging to Doreen and Kath. It was your father's. -Have we got our figures right at £100-150? -I think it's about right. -Should be. It's a nice little thing. A bronze figure of the she-wolf with Romulus and Remus there. Rather nice this, on a marble style base. I'm bid £50 on this. May I say 55? 55. 75. Thank you. £80 here. 85. 90. 95. 100. 110 in the room. At 110 it's in the room. At 240. Right in the corner at 240. All done at 240? -Ooh, I get a kiss out of that! Thanks. I can't believe it. She didn't think it'd sell. -I didn't think it would sell, Paul. What are you gonna do with £240, less a bit of commission? -She's gonna treat us all, she said. -I think we'll go for a meal after the show. Patrick Cheyne and his wife have been running this auction house for the last 17 years. and three-quarters of them are family run. the business is normally run by somebody else. That's what makes this brewery that I'm off to visit so special. In the early 1900s, there were 6,500 breweries in Britain. Within a century, nearly all had disappeared. Robinson's of Stockport is one of the few independent family breweries still in existence. It's now run by eight members of the fifth and sixth generation. but, ever since, the unicorn has been the company symbol. The family have done really well. Robinson's now own nearly 400 pubs. And this is where the beer is allowed to ferment. This largest vessel holds a staggering 86,000 pints. But brewing beer is quite a simple process. You take a really good malt, crush it, add water, you leave it to stand and then drain it out. You reboil it, adding some hops, add your yeast to help it ferment and - hey presto! - you've got beer. What I want to know, in the Robinson's case, what about that extra ingredient - the family? and a member of the sixth generation of the family. How is the business so successful? It's family run and most families fall out with each other. The two key points are that the families still own 100% of the shares in the business. You have to be in the bloodline of my great-great-grandmother Emma Robinson or be a spouse of to own shares. But key to that is actually working in the business and running the business day to day. Frederick Robinson died suddenly in 1890, which left his widow Emma to run the business. She launched the company on the stock market and raised enough money to buy another seven pubs. Obviously, the First World War and the Second World War must have affected the business. There was a reduction in labour as the men had to go off to war. We then employed women to come and work here. There was a shortage at times of some of the raw materials. In fact, beer production during the war increased. under the leadership of another far-sighted family member. Let's talk about the last three generations. They say that if a family business passes to the fourth generation, it's going to be in safe hands. Luckily, it passed to my grandfather Sir John Robinson. He made some very shrewd acquisitions. What about the plans for the future? The future's bright. There are many plans for the future. and their children will be the eighth generation. They love coming here, they love a sip of beer! I don't think there's anything wrong with that. They've got an acquired taste, as I did. I grew up with that. -So, basically, a chip off the old block. So Robinson's is definitely in the blood, but they're not the only people with a taste for it! and has recently won two major awards for its brew. is they continue to abide by traditional beer-making techniques. They don't need a computer. To tell me more about it is Chris Hellin, the master brewer here. -It sounds a bit like an art form. but we're very much a hands-on brewery. and we try to maintain tradition. The industry is evolving, things have changed slightly. Over the years, the process has changed very, very slightly, but not to any great extent. The main differences relate to the raw materials that are used in brewing these days. the head brewer meticulously recorded all the details of his brews back in 1900.
from the same quantity of malt that they used in 1900. So I think that the farming techniques and the malting techniques have progressed significantly. But what about choice selection in hops? Do you go for the bitterness for the taste and the wonderful aroma? Certain hops are responsible for giving both bitterness and hop aroma. It's the art of the brewer to blend those hops together to bring out the best in the beer. They say the proof of the beer is in the drinking. This is called Old Tom and, believe me, it's the cat's whiskers! It's won the brewing industry's International Gold Medal for 2005. Good health to you all and back to the valuation day to catch up with our experts and owners. You've struggled in with this big, circular object made of oak. -Do you know the name for it? -I don't like the look of it. How did you come by it? My late husband was a contracts manager, refurbishing large Victorian houses in Liverpool. -And it was an elderly couple moving to a smaller property. They said that he was so kind to them and they gave him that. I said, "I don't like it, put it in the dustbin." It's made of English oak. -You know what it's for? It's a version of those things you have in Chinese restaurants. That's the works of it. It revolves on this little carousel. Even the original paper labels on it. Nice bit of dirt. -We like a bit of dirt. Like a bit of natural dirt. It's carved with oak leaves all the way round. Oak leaves and acorns. -How old would you say...? -I just think it's a wonderful thing. If it was mine, I'd use it. For my Indian takeaway on a Friday night. Put a little doily on. Why have you decided to sell it now after having it in the loft for 20 years? Because I am going on holiday to Cambodia with my friend. -I thought the money would go towards that! How much does it cost to go to Cambodia? Well, that's a bit ambitious. -In a good sale, this ought to be worth £200-300. Would you be happy with that? Certainly put a reserve on it. I would say a reserve of £180. -A fixed reserve of 180. They're ever so popular. And if they come up for sale, they do very well. Tell me about your wonderful collection. I started collecting back in the 1960s in the junk shops of Stockport. I've always had a fascination for glass. I started with paperweights on the old Stockport market. So these you've bought from the '60s to the present day...? No, I stopped in about the '80s, I would say with the glass rolling pins. There was just too many going up on the wall! Out of all of these 13 here, which one's your favourite? -I must admit the Bristol Blue. -It's such a beautiful glass. Bristol Blue has that brilliant, violet blue colour to it. I think that's rather lovely. -What about the Nailsea one? Don't you like that? -The problem is they're reproducing these now. The reproduction ones are so much thicker, the swags in them. But this is so fine. -Tell me about the one with the threepenny bit in it. -That was bought at a junk shop in Stockport. I saw it, nosing in at bottles, digging for a paperweight. -Is it George's head on the back? -It's a very heavy one. -Yes, that would have been used in the kitchen. I don't think they were ever for any great use. How much did you pay for these? for the better ones, about 25 each. -The Bristol Blue I think I went to about £18. -You did really well. Why do you want to sell them? I went into Bunnykins. Why I fluctuated from the glass, I don't know. If I was to sell these for you, we'd like to sell them as a collection, to keep them as a collection. I would have thought an estimate of between £300 and 500. -How does that grab you? As regards to reserve, I would suggest 300. This one here, I think is worth £70-90 on its own. The Bristol Blue glass is 60-80. -I think the others will just add in and make a good lot. -Thanks for bringing these wonderful vases. -Who was the lad that was carrying one? -But he's too shy to come on camera. -and we sent him home for the other one. -He went all the way back to Leigh. I don't really know much about them. Me dad's auntie died a few years ago and she left them to him. -Tell me why you're selling them now. I'm getting married next year so whatever we make on them is going towards the cost of the wedding. Let's hope we get a good price. What we've got here is a pair of late 19th-century Japanese vases. Satsuma was a province in Japan where a lot of this earthenware was shipped from. These are made purely for the western market, the export market. or late 19th century. These are from the late 19th century, round about 1880, 1890, something like that. with these Japanese figures in landscapes with pagodas. We turn them round and there are more Japanese courtesans and this lovely pendant wisteria. and there are these lovely Japanese motifs in gilding all the way round. And these mon, these circular devices. Look at the bottom. There's actually a signature there. I don't know what that means. Can't read that. it's called the Satsuma mon and that's the badge of Satsuma. -they've got some wear to the gilding. Who was responsible for cleaning them? She's polished these and she's worn away a little bit of the gilding on the neck and shoulders. -Now, how much are we going to make you for your wedding? -What do you call a lot? -On a good day with the wind behind it, it might make 500. That'd be a brave estimate. I think put £400-600m as an estimate. with discretion. On a bad day, they'd go for as little as 360-370. -What's the money going towards? A dress? -I've already got my dress. -It's hopefully going to a chocolate fountain. It's chocolate what flows down and you have the fruits what you put into it and cover them with chocolate. It's for the end of the buffet at night. -Don't get chocolate down your nice white dress. That's nice. Looks like a Staffordshire figure. It's got a date on here, 1792, which tells us it's towards the end of the 18th century, the Georgian period. Tell me about your watch. It came to me from my father. I believe it was my grandfather's. I don't know any more about it than that. -And here you are thinking about selling it. -It is rather, but it's stuck in a drawer. -Then you could sell it and buy another family heirloom. It's a pair-cased watch. One...two. They're both silver and, um...it's just for extra protection this case. It's quite a thick case, isn't it? -and you lift it up and we've got the movement here. Eldon is the maker, from London. I've certainly seen watches from this maker. He is a well-known manufacturer. What's nice about it is the dial is in perfect condition. Normally, we see these and they've got a chip on them or the dial is cracked. -Have you had any work done? -It's in remarkably good condition. The gold hands look nice. To all intents and purposes, it's in lovely condition. Have you ever thought about its date? No. Other than what is on the back of the paperwork behind there. and watch manufacturers and jewellers. If you look on the back of the paperwork, it's got the cost. -Here we are. Who's that? -I don't know who that is. August 1900 and it was 2/6. So 1900 is when it was repaired, but that was 77 years after it was probably made. 1833 is the date for the case. -The movement would probably be around that. 1833, maybe 4. So in pair-case terms, it's a bit late. However, it's in lovely condition. -I didn't realise it would be that much. Well, that's the end of our valuation day. Let's keep our fingers crossed and hope we make our owners a healthy profit in the auction room. Right now it's time for me to visit a famous local house that's also known for its staircase. This is it. It has rather a grand name to match its grand status. and it was installed in 1618 and it's a very rare survivor indeed. The most important thing about this staircase is it's got four internal newel posts. as furniture got larger and they had to get it up the stairs. The newel post holds the handrail in place and the stringer, which is this section here. normally known as the treads, which help us walk up the stairs. The intricate carving on the balustrade forms patterns known as strapwork. an indication of wealth and status of the family living here. The work is so unusual that the staircase even gives its name to the house. I suppose you're wondering why the wood is two different shades? That's because in 1995, Staircase House suffered a massive fire. but, with the aid of photographs, it was restored to its former glory. The lighter timber you can see is the restored part of the staircase. after ten years of restoration work, costing nearly £4 million. and has been added to and developed over the years. who's overseen all the restoration work here. Tell us about the linen room. and then in the 18th century, Stockport was very important for fine silk as well. and, after the hard work of pressing the linen, they would be put into the linen press here. -It was quite a feature of most households. It's a great museum and I believe it's a new concept in museum design. Yes, we've avoided the usual signs "do not sit here", "do not touch". and to sit on the bed and feel the fabrics. That's an important feature. What's been the code of conduct in the restoration policy here? We decided NOT to turn the house back to any one period. and we wanted to show that full span of history so we've got rooms from every period. -You going to take me on a tour? Would you like to sit here? A comfy seat. You've kitted it out in 19th-century furniture, but in the Regency style. -What's the significance of this room? -The house has two important rooms. and this room which we decorated in the Regency period. During the Regency, there was a major event here in Stockport. and here in Stockport, Constable Birch was shot by a silk weaver by the name of Jacob McGhinness. So, imagine people in this room during the Regency, discussing these terrible events. -Shall we move on a few generations? This looks like a typical Second World War bedroom. Yes, we set out the room as it was at the time of the Manchester blitz, 23rd-24th December 1940. There was many people killed, 700 killed altogether. Thousands were injured and 100,000 homes were destroyed. A very significant event. We've imagined the occupant of this room, the young lady writing to her sweetheart in the trenches. -I love the way you've kitted it out. It really does put you back in the period. including the dressing table, the nylons and all the other artefacts. -What does the house mean to the people of Stockport? It's a famous building, in the town centre, steeped in history and it seems to draw you into that history. Well, it's certainly taken me back. for our next batch of antiques to go under the hammer. Fingers crossed. lounging in the attic for 20 years. Tess has decided to sell up and holiday in Cambodia. which, despite fine workmanship, is only worth between £100-200. but Nigel provided information and a value of £400-600. Finally, Evelyn's rolled out her glassware for Flog It! Thomas is a keen glass collector himself. They should fetch between £300-500. Evelyn's collection of glass rolling pins. She started collecting these in the '60s, she's given up now and is selling them all. 13 in total. -with a fixed reserve at 3. -As you say, you've got two nice ones here. This is a very nice one, a Nailsea one. But these are really the only two really nice ones. Some of them are clear glass so £300-500 does sound rather a lot. I would prefer a 200 reserve on them. However, we must see how we go. It looks like you've got your work cut out. I suggest you give them lots of encouragement. Well, we'll try our best. And the best is what's required as Evelyn's rolling pins are up next. Thomas still likes the look of them. -You have some really quite peachy ones in there. -The Nailsea one's rather nice and the Bristol Blue. Peachy. That's a nice term for it, Thomas. Peachy. -They're going under the hammer. Good luck. Lot 30 brings us to a collection of 19th century and later rolling pins. May I say £50 to start me? £50 is bid. At £50. -But we've got to get to £300. 160? 160. 180. 200. 220. 240. 260. 280. 290 here. At 290. At £290. At £290. 300 now. -In the room at £300. All done at 300? They're going. -They cost me about £90 to buy the lot. -and putting more money into your other collecting love, the French paperweights. I think that's a better investment. I think French paperweights are really nice. Or any paperweight. A touch of the Orient comes to Altrincham right now. We've got two Japanese Satsuma vases. -They belong to Laura. In fact, they were Dad's. Hi, Tony. -How did you get hold of these? who passed them on to me. I didn't know what to do with them, so I put them up for auction. -£400-600. That's a cracking valuation. That should get that. -Hopefully, they'll meet the reserve. -They'll do that. Trust me. I think Nigel is bang on on this one. I hope so. There's a bit of wear to the gilding, but they're very good things. Lot 144, pair of late-19th century, hexagonal-shape, Satsuma-ware vases. I'm bid £100 for them. May I say 110? 120. 170. 180. 190. 200. 220. 240. 260. 280. 300. 320. At £400 on the telephone. Is there 420 anywhere? Selling at £400 on the telephone. All done then at £400. -He's put the hammer down. 400. You'll take that, won't you? -How many more months till you get married? -Who's the lucky fellow? What's his name? I've been waiting for this lovely watch to go under the hammer. and you're going to pass it on to somebody else. -quality craftsmanship like that for under £200 nowadays! All these pair-cased pocket watches are beautiful. -Is this a sad moment or an exciting one? -Have you done any auctions before? -Yes. I bid for, um... What was it? ..a piece of furniture for my son. And I got it. A writing desk. -Are you buying anything today? Just going to go home with the money. Good luck. 269, William IV pair-cased silver pocket watch. Rather nice this one. Bid £30 on this one. 85. 85. 90 here. 92. 100? 100. It's in the room. At 110 now. At 130. All done at 130? Going at £130. It's yours. -What are you going to do with that £130? Probably put it for some spends for a holiday in the south of France. Thank you very much. I wish I'd bought that watch, Thomas. -I know, but you can't. -I know, I know, I know! If you love dinner parties, then this lot is for you. It's a lazy Susan. It belongs to Tess, but not for much longer at £200-300. -You need a big table to put it on. -It belongs in a grand country house. -Great for Friday night takeaways. A contemporary use for it. I really like it. -It's worth that and more. Lot 436 is a large, circular, oak, lazy Susan. Rather nice with carved leaf and acorn borders and a floral frieze. -Yes. Well, we've sold it. At 420 here. All done then at £420? Yes! The hammer's gone down! 420 quid! -What are you gonna do with 420 quid? -Put it towards a holiday in Cambodia. -Lovely. Nigel, what a staggering result. I rated that, to be honest. -Would you have given 400...? -I'd have given 200-300 for it! What a wonderful Flog It moment. If you've got anything you want to flog, bring it along to one of our valuation days. You could be standing in an auction room just like this. The star of the day had to be Tess with her lazy Susan. Valued at £200-300 and selling for a staggering £420. It really did spin out the room today. Hope you enjoyed the show. See you next time on Flog It! Paul Martin and experts Nigel Smith and Thomas Plant visit Stockport to find antique and collectibles worth selling at auction. Paul also visits one of the few independent family breweries still in existence and finds two stylish staircases.